We use the durable "Tuff - Jon" porta-pot, made in Evansville, Indiana by T.S.F. Company. Inc. for construction and basic events. It has extra leg-room, comes with 2-ply toilet paper, a 3-way fragrance enhancement system. Event Restrooms are "like new". 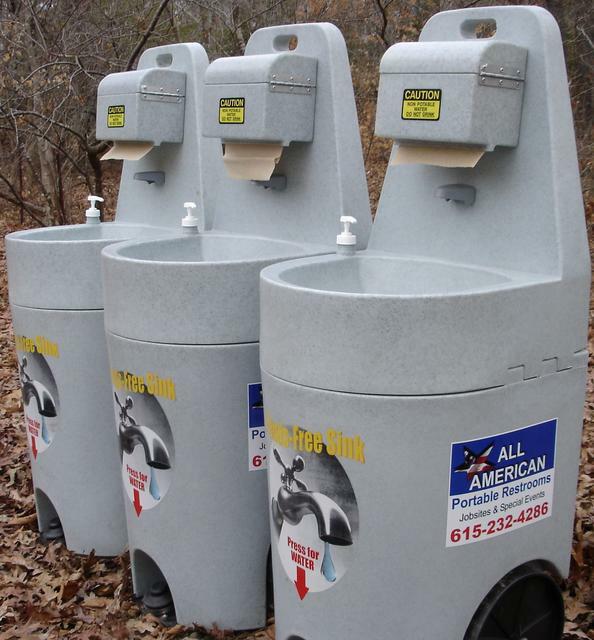 Construction potties are cleaned, hand dried, pumped & restocked weekly. Our Standard Event Restroom is a top quality unit, made in Georgia by PolyPortables. It is popular for Weddings & Assorted Social Functions. Delivered with 2-ply Toilet Tissue, Self- Contained Fresh Water Foot Pump Sink, Water, Paper Hand Towels, Spray Lotion Soap, 3-Way Fragrance Enhancement System, Mirror, & Coat Hook. ​Our most spacious, (5' x5') High-End Restroom is a favorite for Private Functions demanding the most in luxury & is placed completely ready-to-go with Lighting, Super-Plush Toilet Tissue, Self-Contained Fresh Flush Toilet, Self-Contained Fresh Water Foot Pump Sink, Water, 3-Way Fragrance Enhancement System, Spray Lotion Hand Cleanser, "Take-a-Seat" Spray Toilet Seat Sanitizer, Paper Hand Towels, Waste Paper Basket, Purse/Coat Hooks, a Full Length Mirror, Extra Large Door, & easily accessable ground level entrance. Anytime extra room is desired, this Handicap unit can serve a multitude of occasions for family or community activities. As with all of our portable toilets, it arrives ready, & fully stocked with 2-Ply Toilet Tissue, Hand Sanitizer, 3 Hand Support Bars, 3-Way Fragrance Enhancement System, & has an Extra-Large Door with Pneumatic Assist Closer. It sits ground level for easy Wheel Chair, or Stroller access. This "Tuff-Jon" Single Unit Free Standing Sink is made in Indiana by T.S.F. inc. It has a deep basin, a "Hands Free" foot operated pump, is fully self- contained, & is delivered stocked with Fresh Water, Paper Towels, & Hand Soap. FREE Hand Sanitizer & 2-Ply tp upgrade.